We needed to stop water running into our back yard and I needed more practice/experimenting with timbrel Arch before I do the stairs in the groined building. 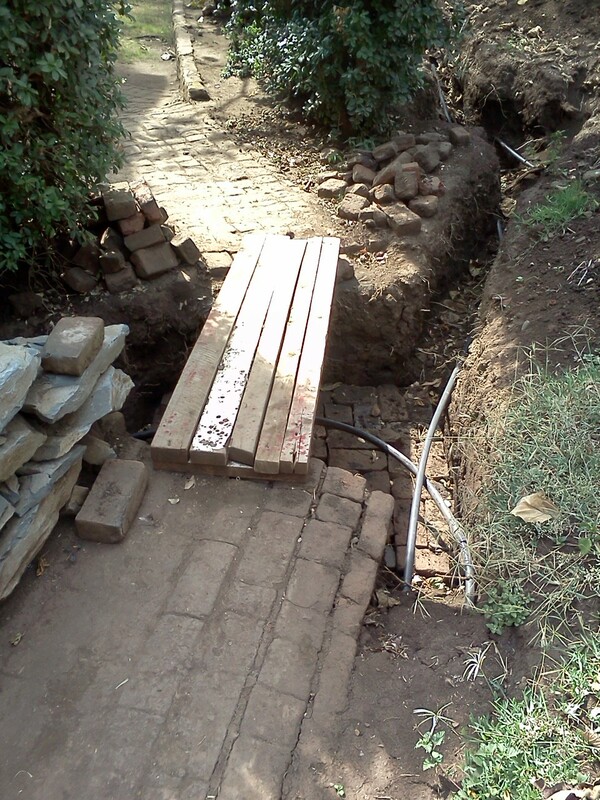 We have this path of old pieces of bricks and water runs down into our back yard. Bernice wants a bridge here so water goes off to the left into a storm runoff ditch that dissipates the water into our front lawn. before it was running over the path and some down into the back yard. The bricks helped us out but it is now time to put in something that is cleanable. Around our house is too much mud and our lifestyle we track in mud. It sticks to the bricks. 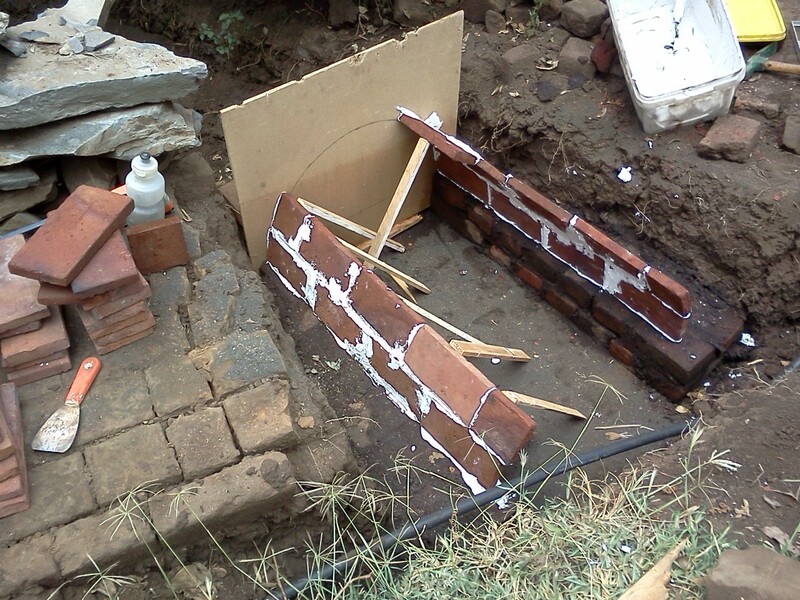 So i will also replace the brick pieces with irregular flagstone. In my studies I have come upon timbrel or Catalan vaults. You build 3 layers of clay tiles in low arches or vaults. The first layer can be placed without form work using gypsum, which dries fast. Then next layer is using cement mortar and covers the first layer's joints. So like plywood. It is stronger than just one thick layer, and easier to hold the light "tiles" up. Gustavino used this method all over the east coast, ie Boston Public library. Above I butter the tile (actually a thin brick) on two edges, tap it into place, hold a few seconds and then use a stick to lightly support the piece. I later learned that it helps to be generous with the gypsum mortar on inside and out. helps hold until you finish the arch. I used gypsum wall plaster, not sure how different it is but it worked. 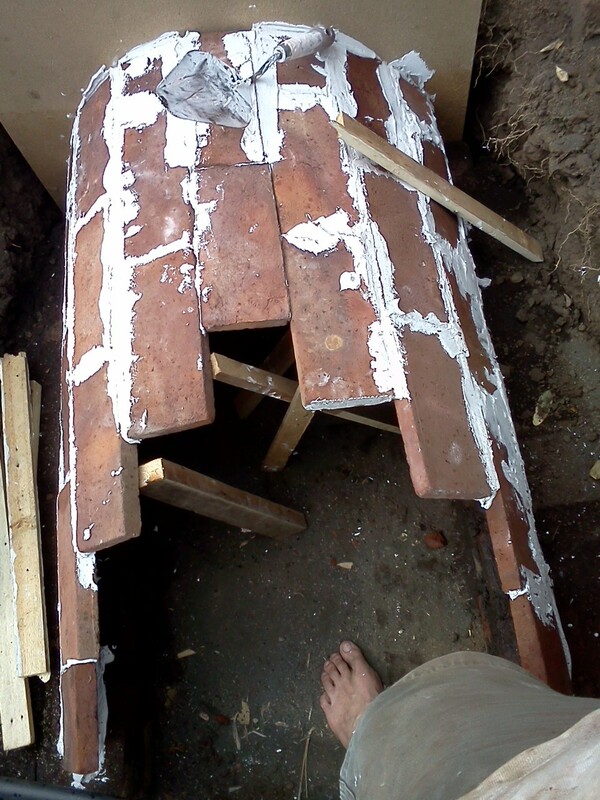 Note: the strength is not in the mortar at all, it only holds tiles in place. 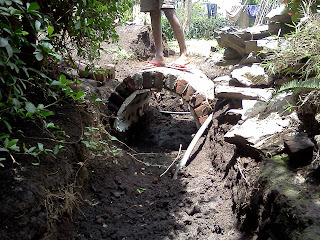 Once I got the top pieces in to finish the arch it is stronger. you touch the end piece and they can fall, but once closed it immediately is firm. 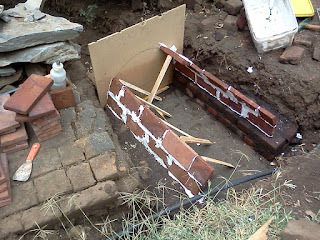 Next I used the timbrel arch as form work and stood standard bricks over the whole thing and it is very strong. Now to lay some stones over the top. This is really a great invention but I this the thin tiles or bricks need a healthy pasting otherwise they can be broken by the weight. Yes quite right, by itself one thin vault will be weak. You need three thin layers to make it strong. 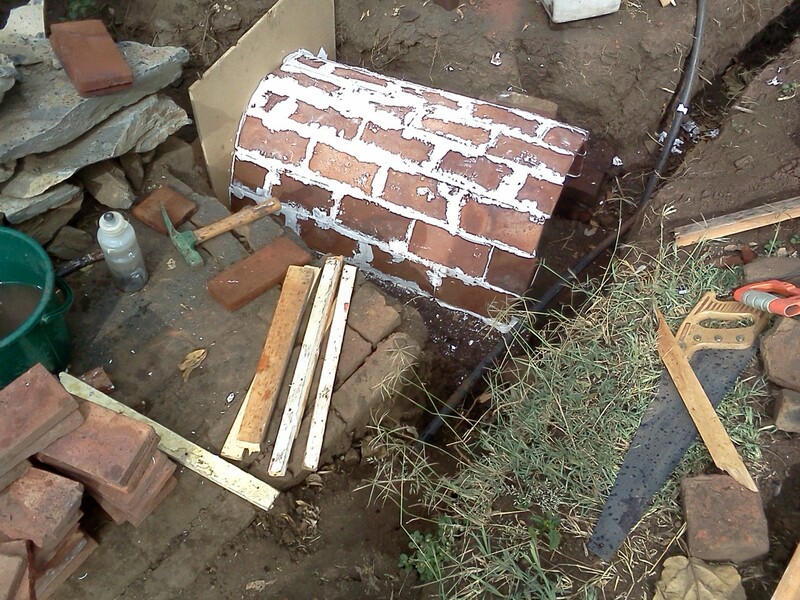 I have now added the picture after I added a arch of rowlock bricks. 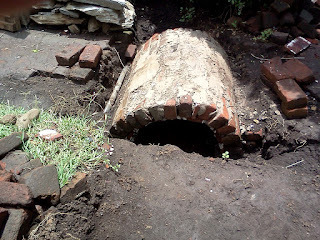 I could remove the thin brick vault now. I was using it like formwork. Thanks for reading and posting. looks great Erik. I did a little wall repair last year that served the same purpose. There's something about arch building isn't there? Yeah there is something about arches. Can you imagine you were living 500 years ago and your job was to build the big cathedrals? To die for. If I had a spare half million I would build a cathedral. I am starting my own home next spring and have given vaulted ceilings using the Guastivino system a go. I think I would do something like you are here but with concrete instead of brick on top of the tiles. I love the look of the tiles and the ability to do them without centering is fantastic-says the man with no experience yet. I am making my way through your posts. Thanks, very enjoyable.